Volunteer Voices is written by Sarah Katz-Hyman. Sarah is a student at University of Maryland and lives in College Park. She previously wrote about Food For All – DC. Miriam’s Kitchen (MK), housed in Western Presbyterian Church, provides a full range of services, activities and resources for homeless man and women in D.C. They offer four main programs that comprise their services. Their meals program serves over 300 individuals for breakfast and dinner Monday through Friday and for lunch of Wednesday. They also have case management services and social workers connect guests with various services, from providing housing resources to simply getting a toothbrush. Miriam’s Kitchen also has a therapeutic program, called the Studio, where guests can participate in activities like knitting, book club, art classes, yoga and many more between breakfast and dinner. MK has even partnered with Theater J to bring guests to shows, and Theater J actors have come to MK to talk to guests and share their stories through monologue performances. Their fourth program is advocacy and education. MK partners with other service organizations in the District to raise awareness with a focus on housing and a goal to end chronic homelessness. Western Presbyterian Church, United Church, and GW Hillel Association founded Miriam’s Kitchen in 1983 as a response to a spike in homelessness in D.C. Just before MK was founded, the institutionalization occurred, cutting funding for mental health and leaving many patients on the streets. MK started out just providing breakfast but has since expanded to provide a whole array of services. 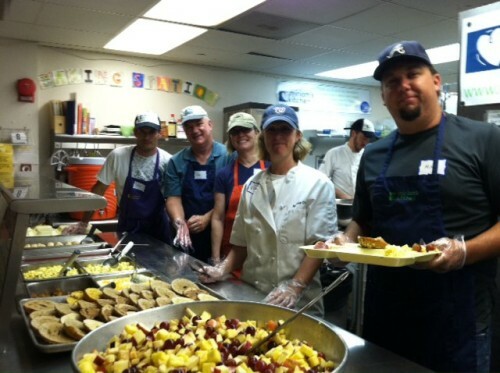 Employees fondly refer to MK as a “souper kitchen” because of all the services they provide beyond just meals. MK focuses on healthy and nutritious meals, and through donations from farmers’ markets, local fishermen, farmers, hunters and grocery stores, they are able to provide each meal for under $1.00. They have many guests whose health needs require a healthy diet, and they believe that food is key to building trusting relationships with their guests. . They operate in a large room that serves as both their dining room and as the space for the Studio, so making a welcoming community is central to their mission. They get about 20% of their funding from an annual gala(http://miriamskitchen.org/100-bowls-compassion-celebrates-nordic-nights-mark-your-calendars-may-2-2013) (this year on May 2), and 1% from Federal funds. Over 2,000 people a year volunteer with Miriam’s Kitchen. Because every $1 provides one meal, they encourage small money drives in offices or organizations. If you are interested in volunteering contact Jennifer Dean, In-Kind Donation Coordinator at [email protected]. Volunteers are needed in all areas of Miriam’s Kitchen. Whether helping prepare meals in the kitchen, doing advocacy work, coordinating donation drives or planning events, every person can help. People with special skills who want to teach classes are also encouraged to contact Jennifer. If you are interested in a tour or want to learn more you can contact Ashley Lawson at [email protected].